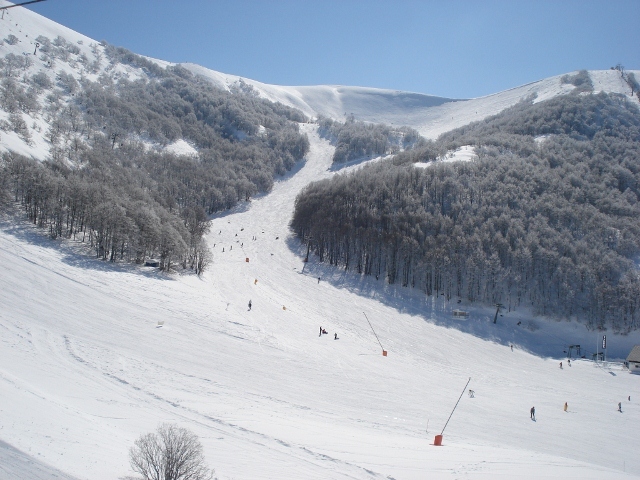 As the name suggests SkiAbruzzo.com specialises in ski holidays to the best of Abruzzo’s ski resorts. At first we found it hard to believe that it was possible to ski so far south in Italy but, having been there and skied the uncrowded pistes and enjoyed the genuine Italian hospitality on several occasions, we decided the time was right to let theother skiers into the secret. We have many years experience of ski tourism and in particular the mountains of Italy. We have a passion for all things Italian including the wine and food and believe that Abruzzo offers a truly Italian experience. It will be our pleasure to tell you about our featured resorts and create your own tailor made itinerary. Hotel prices are competitive, as there are few overseas tour operators creating the demand which pushes up prices, and long may it stay that way! The hotels are all family run, and a warm welcome is assured, along with delicious food to look forward to after a day on the slopes. We can organise airport transfers with our friendly transport supplier to meet you at either Naples, Pescara or Rome. They will whisk you up to resort in modern, clean vans and minibuses with plenty of room for your luggage and ski equipment. For those booking Half Term week in February we run group coach transfers from Naples airport to meet the British Airways and Easyjet flights from London Gatwick. Ski Abruzzo is committed to customer satisfaction and consumer financial protection. We are therefore pleased to announce that all our customers are covered by TRIP insolvency protection in accordance with the Package Travel Regulations. You will have complete peace of mind that your initial deposit plus any subsequent balance payments to us are covered. The policy will also include repatriation if required, arising from the cancellation or curtailment of your travel arrangements due to the insolvency of Ski Abruzzo. If your idea of a ski holiday includes short airport transfers, uncrowded slopes, great prices for hotels, lift passes, ski school and equipment rental, then skiing in Abruzzo is for you!